There are two types of archives that I suggest you do. The first is Archiving Submittals. The second is Archiving Milestones. This post is about archiving Project Submittals. Those contractual deliverables that come at specific times in the life of your project. Archiving a project is critical to the retention of data for future use. Archiving CAD files when a submittal is completed will retain needed data. The active project CAD files always remain in the proper folders as the project progresses from SD to Final Submittal. Never move the main files. They stay in the same folder that they are created in. Some firms may move files from one folder to another as the project progresses. I do not recommend that practice. Users can get confused on which file is the latest. Just keep them in the same folder. Once the files & folders have been created and files generated, the CAD files do not move. They are not moved to new folders when there is a change in project phase, such as, SD, DD, CD or As-built. When you move from one phase of a project to the next you may archive a copy of the complete issued files and folders under a new folder called “Issue”. 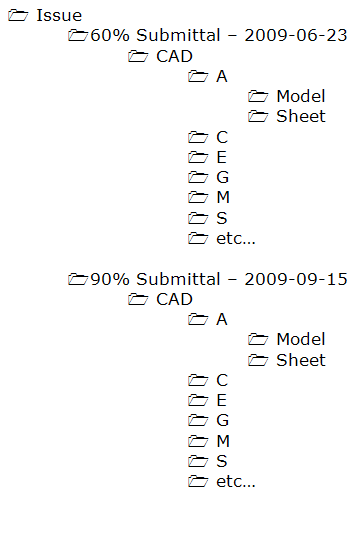 Copy the complete folder tree into the Issues folder as a submittal is made. This means that under the Issue folder there will be many subfolders. Only files needed to reproduce the Issue should be copied. Do not copy non-issued files. The “live” CAD files remain in the proper folders and continue to be developed. When another milestone is reached another archive will be created under the Issue folder. Burning CDs or DVD can be done once the Issues is complete. Issues that are no longer needed can be removed from the server after they are burned to DVD. Just wanted to say thank you for taking the time to put this site together and all the hard work. I just started reading it, but I am sure it will be something I look forward to reading on a daily basis.